Parametric Modeling with SOLIDWORKS 2015 contains a series of sixteen tutorial style lessons designed to introduce SOLIDWORKS 2015, solid modeling and parametric modeling techniques and concepts. This book introduces SOLIDWORKS 2015 on a step-by-step basis, starting with constructing basic shapes, all the way through to the creation of assembly drawings and motion analysis. This book takes a hands-on, exercise-intensive approach to all the important Parametric Modeling techniques and concepts. Each lesson introduces a new set of commands and concepts, building on previous lessons. The lessons guide the user from constructing basic shapes to building intelligent solid models, assemblies and creating multi-view drawings. This book also covers some of the more advanced features of SOLIDWORKS 2015 including how to use the SOLIDWORKS Design Library, basic motion analysis, collision detection and analysis with SimulationXpress. 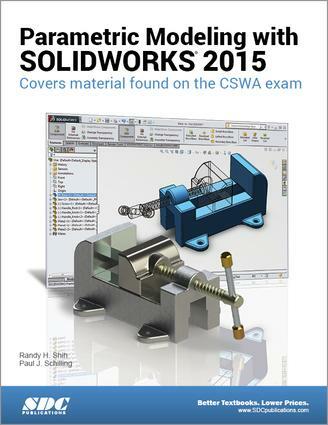 The exercises in this book cover the performance tasks that are included on the Certified SOLIDWORKS Associate (CSWA) Examination. Reference guides located at the front of the book and in each chapter show where these performance tasks are covered.